I want to start by saying that I truly feel blessed to have found a rewarding career doing something that I love! When I share with new acquaintances what I do for a living one of three things always comes up: I’m asked if I do weddings – I don’t, they assume I only plan parties and get to drink and dance the night away – I don’t just do that either. I’m also frequently asked how someone new might get into such an exciting career – THAT, my friends, is a fantastic question, and the focus of today’s blog entry. Event planners are hired to create amazing experiences that leave a lasting impression. They can plan anything from corporate parties or meetings and luncheons to trade shows, charity events, award presentations and, of course, parties and weddings. This list is by no means exhaustive and specializations are commonplace but how do you know if this career path is the right fit for you? First and foremost when considering event planning as a career you must be a people pleaser. You’re never serving just one client either. It’s not that simple. Your event may start with the person who hired you but you will inevitably be dealing with multiple stakeholders, including suppliers, guests, committee members and, most importantly, your attendees. The job of an event planner is to create amazing live experiences for our clients and their guests. So, if working with people or people pleasing is not your thing – neither is this job. Part two of attitude is the willingness to do things that might be outside of your comfort zone. Addressing large groups of people, having uncomfortable conversations, even picking up garbage – all part of the job. I have always said, I would never ask my staff to do something that I myself would not be willing to do – and, trust me, you’ll be doing a lot things you never considered would fall under the job description of an event planner. I was recently at an International Live Events Association (ILEA) event where I was asked how old is too old to break into event planning. In my opinion, this is a career you can start at any age. On slow days I may work only a few hours but when gearing up for an event there are weeks where I can burn through 8-14 hours a day and still not have enough time to get everything done. This might also mean not having a true day off until an event is over. And while the longer days on site seemed a bit easier on me 15 years ago – I can say that the wisdom of getting older and embracing the “work smart not hard” motto can certainly ease the workload. Naturally, it’s all in the planning! For those who might think of this as a “fun” career, what I would suggest is that in order to thrive you MUST be detail oriented and have the ability to multitask and switch gears easily. Do you like list making and checking this off? Perfect! Do you see problems as an opportunity to find new and unusual solutions? This is your dream job! Some days you’ll stare, uninterrupted, at spread sheets for hours while others you’ll be on the phone nonstop dealing with unexpected hiccups. Being flexible and ultra-organized is the key to success in this business. 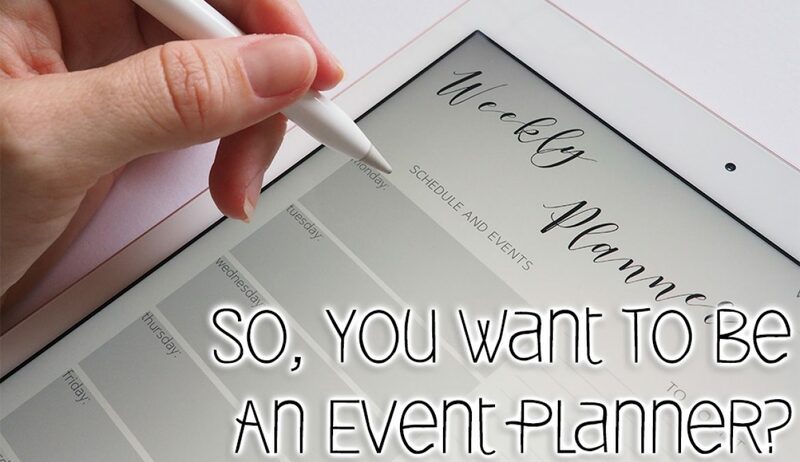 Most of an event planners job is pre-planning so on the day of the event, things go smoothly BUT every event planner will tell you that things NEVER go 100% to plan – This could be a whole other post of its own! There’s a reason event planning is listed as one of the top 10 most stressful jobs and your ability to cope with stress while still striking a manageable work/life balance is what will ultimately determine if this is the industry for you. Having second thoughts? Or maybe now your thinking YES – sign me up – where do I start? I always recommend to try some of the following avenues if you’re truly thinking about making a move to enter the world of event planning. Volunteer at events where you get to experience the behind the scenes aspects of what we do. Take an in-class certification for event planning. The instructors are often event planners themselves so you will hear real life examples of the good, bad and ugly of what we do. Plus you’ll meet like-minded people that may help you find a job some day. Join a local event planning association. In Calgary I would suggest ILEA (International Live Events Association) or MPI (Meeting Planners International). A great place to start networking with planner and vendors and a must have for anyone starting out. Event planning can be an unbelievably rewarding career for the right individuals. If you’re a go-getter who loves organizing things and has a personality that is detailed oriented and diplomatic this might just be the perfect fit for you! Jennifer James is bold and spirited, with an infectious enthusiasm. Through her company, Jennifer James Events, has brought her passion for planning, designing, organizing, creating and marketing to the Calgary corporate landscape for over 15 successful years.